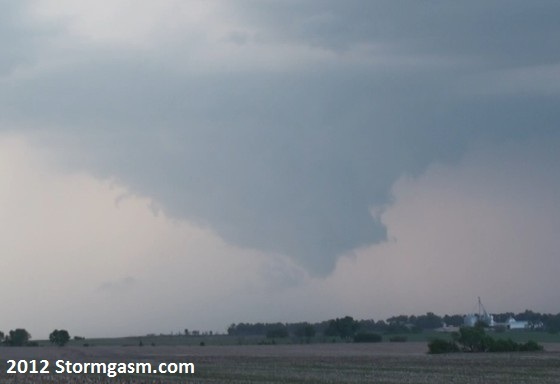 Wall cloud northeast of Seward, Nebraska. The drive from Pittsburgh, PA to Wichita, Kansas was long and extremely difficult this time. It had only been about a month since MaryLeigh and I had made the 19 hour drive for the tornadoes back in mid April. But for whatever reason this time the trip was a lot more difficult! We left Pittsburgh at 4:30a.m. Tuesday (May 22) and arrived in Wichita at around midnight (May 23). We were up much later though looking at data and trying to decide on our chase target. Upon closer inspection later that morning after very little sleep, I decided we needed to drive north to York, Nebraska and wait for storms to form along the cool front. After looking at data in York around 3pm, it was clear storms would form along a pre-frontal trough axis. I knew the tornado potential on this setup was not great, but I was a little more excited seeing that storms would form along anything other than the actual cool front. With the wind shear that would be present, if we could get a discrete storm it would likely be a supercell with at least a shot at producing a tornado. We headed east to highway 15 and passed through Seward. Storms were intensifying to our north, but as we continued further north the southern most cells weakened and the storms further north began forming into a bow echo. It was becoming clear that the CAP was still too strong. We headed east on higway 92 and things kept looking worse. So, we stopped in Wahoo (interesting town name, huh?) and grabbed a bite to eat around 5:30. I remember thinking that it’s usually not a great sign when you have time on a chase to get something to eat at dinner time! Finally, a discrete storm developed to our southwest. So we headed back west on highway 92 and dropped south on highway 77. After we passed over a hill we could see a large wall cloud to our southwest! We started getting excited, but the wall cloud quickly became undercut by outflow before we could snap a decent photo in between the trees and hills. But things were looking up, because just 30 minutes ago we were eating fast food and thinking the chase might be over. We reached highway 66 and pulled over right in front of the mesocycone (it was moving pretty slowly). A new wall cloud was beginning to develop, and before long a nice tail cloud formed. There wasn’t much rotation within the wall cloud, but the storm had pretty good mid level rotation and you could see the rear flank downdraft trying to occlude everything and form a funnel. But the rotation wasn’t strong enough, and cool outlfow pretty much put an end to that. We needed to head east and stay ahead of the storm. I knew a new wall cloud would form soon further east. Supercell northeast of Seward, Nebraska. Ironically as the wall cloud was falling apart the tornado sirens turned on! We blasted east to get away from the rear flank downdraft rain/hail. 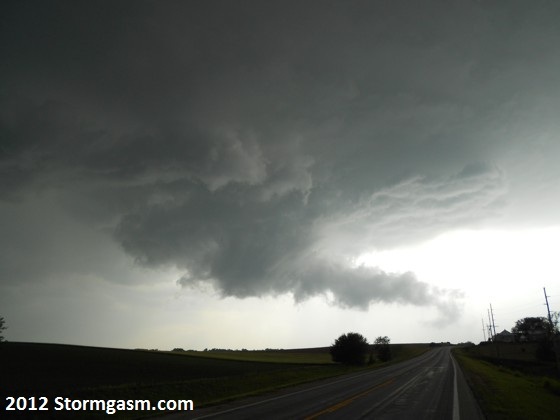 The storm remained a supercell and continued producing wall cloud after wall cloud in a cyclic fashion. At one point the storm produced a funnel and MaryLeigh and I both saw a brief circulation in the dirt beneath the funnel. But it was both brief and extremely weak. Action shot of Jim Bishop in chase mode! So it turned out to be a really fun chase day. We really enjoyed viewing the numerous wall clouds this storm produced, and we were treated with a nice lightning show that night too! Now it’s time to look at more weather data and decide when and where our next chase target is going to be. 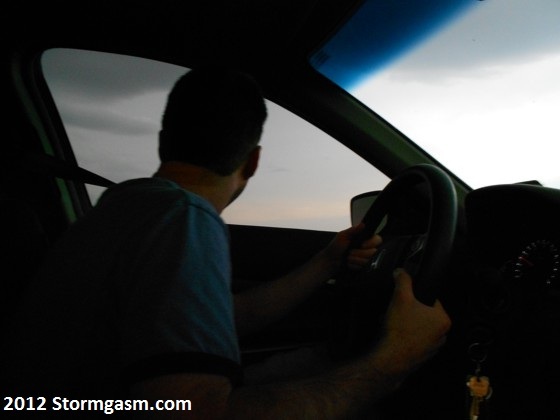 It’s time for our storm chasing trip! It’s been a month to the day since I made a post on this blog! And while that’s shameful given it’s already approaching late May, it’s not without reason. The spring has been flying by really fast for me, and that’s mostly because I’ve been working a lot (don’t we all?). But also and more to the point of this blog, I’ve been waiting for the weather pattern to turn active again for severe storms and tornadoes. Well – it appears likely the weather pattern is about to do just that. And barring some unforeseen change, my wife and I will be making the long drive from western PA out to the Great Plains this upcoming week for our annual storm chasing trip! For anyone that has monitored the weather pattern as of late they’d probably notice the low frequency of tornado reports over the past two to three weeks. Following the tornadoes (one of which I managed to document) in Kansas/Oklahoma back on April 14, there have been very few severe storms setups across the Great Plains. Things did pick up in frequency somewhat during the first week of May, but due to a persistent strong CAP (warm layer above the surface that suppresses t-storm/tornado growth) the severe events that unfolded yielded few tornadoes and rather insignificant supercell storms in general. Honestly, all the setups were marginal and frustrating for any storm chasers out there. You basically had to be in southeast Texas near the Gulf coast to view a tornado so far this month. Following the largely pathetic severe storm period in early May, a ridge of high pressure developed over the Great Plains and Rockies – making an already crappy pattern even worse! 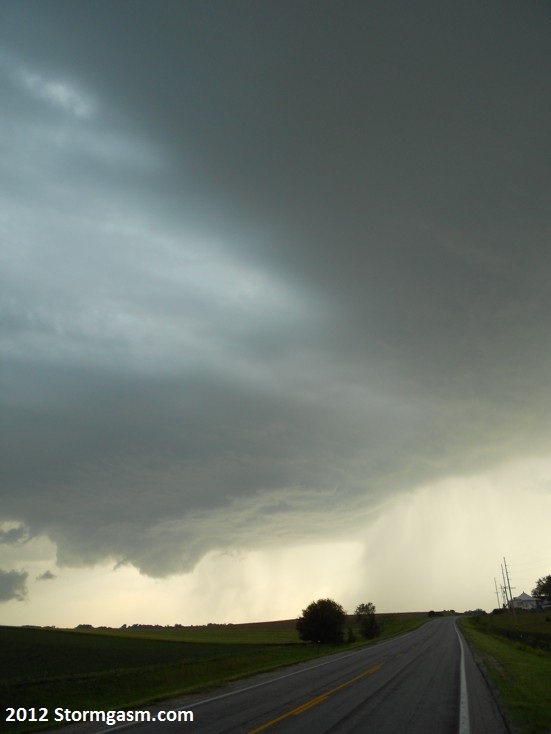 As a result, storm systems and strong jet stream winds (owing to adequate wind shear for supercells and tornadoes) were essentially blocked from reaching the plains during the second week of of May. So needless to say, May of 2012 has thus far been the worst May for storm chasing since 2009 and 2006! But it appears that the atmosphere is finally recharging and severe storm setups are returning for the last ten days of May extending into early June. But there are two major factors that could cause problems in regards to tornado formation beyond mid-week – the strong CAP and a strong ridge of high pressure that will be returning to the Plains quickly. To combat that, there is a powerful upper level ‘jet’ (strong jet stream winds) over the northern Pacific Ocean that is poised to crash into the western U.S. in just a couple days, with more energy coming behind it later. As this ‘energy’ ejects into the Great Plains there will undoubtedly be severe storm setups from Kansas into Nebraska/South Dakota and perhaps as far south as Oklahoma depending on CAP issues. A couple of these setups could be big tornado producers if enough forcing is present before the ridge rebuilds in earnest. The details are sketchy and I’m concerned about how quickly the ridge re-builds over the plains later in the week on into Memorial Day weekend. But I’m hoping there will be setups extending into the weekend and early or mid the following week. All weather talk aside, we have a LOT of driving to do in a couple days.